Beth sent me the first three books to review and I am in love! 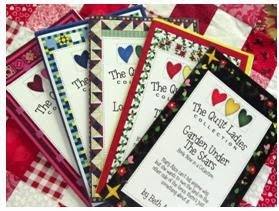 They are great, wholesome stories and the quilt patterns that are included are beautiful. They are great for those of you who quilt already, but they are also wonderful for those of you who have thought about quilting. The story and the matching pattern might just help push you into action. I definitely recommend these for gifts. It would be top on my suggested Christmas gift list if gift that you have not purchased yet then this would be a thoughtful and unique gift.